Learn Guitar or Drums from top musicians in a fun atmosphere and record regularly to build a portfolio of your playing. Mike's education and ability to play many instruments enables him to teach in a vast range of styles from classical to hard rock and everything in between. Mike was Head of Vocals at Brighton Institute of Modern Music between 2004-2006 where he taught technical development, sightreading and aural perception. He was also music director of a choir for Ozzy Osbourne in 2004 for the Olympic Torch Concert, Pall Mall, London in front of 70,000 (as featured in True Hollywood Stories), and Pitchshifter (Mortal Kombat soundtrack) at the London Astoria. He has worked with The Kooks, Toploader, Carleen Anderson (Brand New Heavies), Kelle Bryan (Eternal), Kevin Nixon (Kula Shaker), and many more. Mike has written original music for many projects including feature film 'A Perfect Plan' starring Patrick Bergin (Sleeping with the Enemy, Patriot Games), corporate giants Braun for two consecutive years, virtual instrument company Realitone founded by Mike Greene (Emmy award winning and platinum record producer), SagePay, and Paladone. Mike is also an examiner for Trinity College London Rock and Pop exam board so knows exactly how to prepare you for an exam or audition and has a 100% pass rate with mostly merits and distinctions through Associated Board of the Royal Schools of Music, Rockschool, and Trinity. Additionally, Mike manages and plays guitar in his two function bands and has performed at/for Hampton Court Palace, Natural History Museum, London Eye, Royal Horseguards Hotel, Getty Images, Mike Jatania, RAF, The Gherkin, and continues to play in many more prestigious venues in the UK. Tom has performed as a drummer on live sessions for “BBC Introducing”, BBC6 Music hosted by Steve Lamacq and has appeared in the popular online music publication DIY magazine as well as many others. Tom plays drums in two function bands, both of which perform regularly in the UK`s most prestigious venues, including Hampton Court Palace, Natural History Museum, Royal Horseguards Hotel, The Gherkin and many more. He has played at festivals with Billy Bragg, Buzzcocks, The Levellers, The Strypes, Yonaka and has also shared the stage with members of Labrinth. His talents stretch further to include him being a music licensing specialist who has worked on briefs for worldwide advertising campaigns, such as: Rolls Royce & Mail Chimp. He has also sourced and cleared the music for a number of independent films, corporate clients and many other media uses. 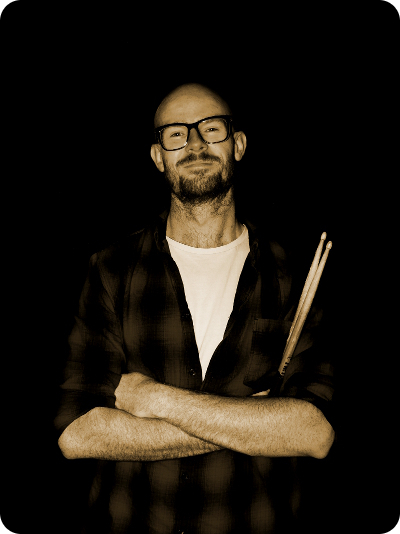 Tom is an expert in all commercial styles of drumming and is very familiar with the most popular exam boards ABRSM, Rockschool and Trinity, maintaining a 100% pass rate with mostly merits and distinctions. He excels at making students feel at ease whilst tutoring them and helps them to become the best drummer they can be.